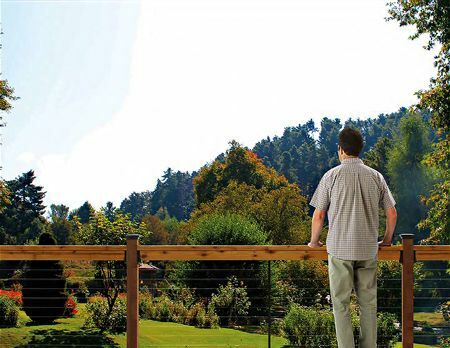 Enjoy a clearer view of your garden with cable railing. (BPT) - Communing with the bounty of nature in your own backyard is one of the many advantages of having a deck. Not only does it boost home value, a deck gives you a comfortable venue for enjoying the outdoors - and what could be more environmentally friendly than spending some time with Mother Nature? But is your deck really as "green" as it could be? Wood and composites are the two primary types of boarding used for decks. Wood is a renewable resource; more trees can grow to replace the ones harvested for your deck boards, and when your deck's usable life ends, you can recycle the wood it was made of. However, pressure-treated lumber is not recyclable. While the preservatives it's treated with make pressure-treated lumber last longer than many types of untreated wood, it's less eco-friendly in the long run because it must be disposed of instead of reused. If you prefer a wood deck, look for naturally weather- and pest-resistant wood varieties like California red wood, western red cedar or ipe. Stainless steel cable railing, like Ultra-tec(R) by The Cable Connection, not only provides unobscured views from your deck and a sleek, attractive look, it's also 100 percent recyclable. What's more, Ultra-tec(R) is made from recycled stainless steel, meaning fabrication requires less consumption of resources like fossil fuels, less consumption of minerals through mining, and a reduced environmental impact. Greener railings can also save you some green; you can easily install stainless steel railing yourself on a new or existing wood or composite deck. To learn more, visit ultra-tec.com. If you opt to build your deck with wood, some types will require regular maintenance like sealing and staining. Rot- and pest-resistant woods may not need to be sealed, but will weather to a silver-gray color unless you stain them every year. Many stains contain a blend of agents meant to inhibit the growth of fungus or deter pest infestations, and may also contain volatile organic compounds (VOCs). Look for stains and sealers that rely on natural ingredients, such as hemp oil, beeswax, carnauba wax and water. Choosing greener deck options can help ensure you enjoy your outdoor environment throughout the year, and help preserve the environment for future generations.